Plus a base of Isoflavone, Vinpocetine, Arginine, Alpha Lipoic Acid, Ginkgo, Special Chinese Herbs, and Key Vitamins and Minerals RingStop (Ring Stop) contains the highest quality, all-natural proprietary homeopathic formula in strict compliance with the Homeopathic Pharmacopeia of the United States, Homeopathic remedies have demonstrated unsurpassed safety for over 180 years. RingStop helps reduce the annoyance and frustration that comes with tinnitus. For added benefits, RingStop also contains a base if all-natural herbal extracts, specific amino acids, important antioxidants, and special vitamins and minerals. COntains No Synthetic drugs, artificial chemicals, or additives. Indications: For the symptomatic relief - and prevention of the recurrence - of minor, occasional tinnitus symptoms, ringing and/or buzzing in the ears, and sensitivity to noises after diagnosis by a doctor. Imagine hearing a noise in your ears or head that sometimes doesn't go away. This maddening noise, called tinnitus, can range in volume from a ring to a roar. Some people hear buzzing, hissing, roaring, whistling, chirping or clicking instead of ringing. Each person has a unique version. It can be intermittent or constant, with single or multiple tones and its perceived volume can range from subtle to shattering. Most people will experience tinnitus symptoms at some time in their life. In America alone, as many as 50 million people say their ears ring. About 12 million have tinnitus severe enough to seek medical attention and 7 million people are so seriously bothered by tinnitus that living a normal life is not possible. Tinnitus symptoms can, in fact, interfere with concentration, work, sleep, relaxation, normal communication with others, can can lead to psychological distress. There is no known cure for tinnitus, but now there's hope with RingStop! Up to 90% of all people who seek treatment for tinnitus have some level of hearing loss, usually noise-induced. Exposure to loud noises is by far the most likely culprit. Other suspects include: stress, high blood pressure aging, ototoxic (harmful to hearing) drugs, ear or sinus infections, jaw, neck, or cranial bone misalignment, thyroid disorders and head and neck trauma. Since tinnitus might be a symptom of another health problem, see your doctor for any condition which may require his/her services. Caffeine, tobacco, alcohol, aspirin, antihistamines, and prescription or even over-the-counter medications can aggravate existing tinnitus. Although there remains no cure, tinnitus symptoms can be overcome. RingStop is designed to safely relieve and prevent tinnitus and ear noise symptoms. Dr. Martin is a nutritionally and internationally recognized authority on human health. He is a diplomat of the American Academy of Anti-Aging Medicine and a board certified Chiropractic Physician and Phsio Therapist. His popular national radio talk show Health Talk is heard by millions each week. RingStop is the best-selling formula used by thousands to combat symptoms of tinnitus. Tinnitus symptoms can range in volume and include ringing, buzzing, hissing, roaring, whistling, chirping, or clicking noises in the ear. It can be intermittent or constant. 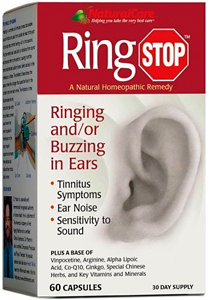 RingStop’s unique blend of homeopathic ingredients has proven to lessen and reduce this maddening noise, and, in some cases, eliminate it. The homeopathic substances in RingStop have been formulated in compliance with the Homeopathic Pharmacopoeia of the United States. Other Ingredients: Alpha Lipoic Acid, Black Sesame (Hei Zhi Ma) (seed), Butchers Broom extract (leaf), Cassia (Gui Zhi), CoEnzyme Q10, Cyanocobalamin, Folic Acid, Garlic (bulb) (odor-controlled), Gelatin, Ginger (root), Ginkgo biloba extract (leaf), Glycerin, Inositol Hexaniacinate, Job’s Tears (Yi Yi Ren) (seed), Kelp extract, L-Arginine hydrochloride, Ligusticum wallichii (Chuan Xiong) (root), Magnesium amino acid chelate, Methyl Cobalamin, N-acetylcarnitine Hcl, N-acetylcysteine, Peony (Chi Shao) (root), Pueraria (Ge Gen) (root), Pyridoxine Hcl, Riboflavin, Thiamine HCL, Titanium Dioxide (natural mineral capsule color), Vinpocetine, Vitamin A acetate, Zinc amino acid chelate. Synthetic chemicals, additives, artificial drugs or colors. Start with two capsules twice daily for the first 30-90 days. Thereafter, reduce the dosage to one capsule twice daily. For best results, use daily for 3-6 months. If you are presently taking agents for blood-thinning, such as Coumadin® or warfarin, or if you are pregnant or nursing a baby, seek the advice of a health professional before using this product. If symptoms continue to persist after a reasonable period of time, or if symptoms get worse, consult your doctor. Keep out of the reach of children.